Stefie: For his birthday dinner, I decided to take Marcus to Chef Eric Ripert's culinary pantheon, Le Bernardin, dedicated to delicate fare of all sorts from the sea. This establishment has been on our bucket list for quite some time, and there didn't seem like a better time to go than for his birthday this year. 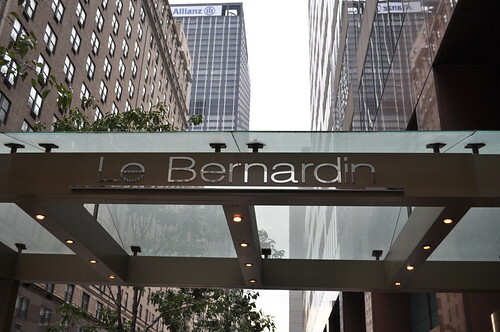 When we were to make reservations, I had found out Le Bernardin had been closed for renovations during August and was not expected to reopen until early to mid-September. Luckily, Marcus and I were looking to have the dinner at the very end of September, so there was ample time (I hoped, at least) to make a reservation. I monitored the restaurant's website, which told me I could start calling to make reservations on or around August 10, so that's exactly what I did. A little under two months in advance, I was able to get a table for two during the 5:45 PM time slot for September 30 without many issues. So with the dinner several weeks away, we had much to look forward to -- a wonderful meal inside a completely new conceptualized interior. I had heard about Le Bernardin vaguely before I became really interested in learning more about food, culinary culture, and the chefs that make all of that magic happen. I knew it was the famed seafood restaurant that had been around since the late 80s and had carried its legacy into the new millennium. A few of my family members had briefly mentioned that they had eaten there decades earlier, but I didn't know much about Chef Eric Ripert until a couple years ago. It had happened when I was really into Season 5 of Bravo's Top Chef, which took place in my 'hood, New York City. It was really awesome knowing where the contestants were traipsing around in the city picking up produce and ingredients for their challenges and learning more about the city that I love and cherish, especially culinary secrets that I hadn't discovered yet. On its eleventh episode, the remaining contestants were invited to a six-course lunch at Le Bernardin with Chef Ripert and Chef Tom Colicchio, the show's host. After the meal, Chef Colicchio revealed that the Elimination Challenge for that week was to recreate the six-course menu that was just served to them at Le Bernardin. So witnessing the magic of "the Fish Guy" (i.e., the informal title given to Chef Ripert and rightfully so) in the courses he created on his restaurant's menu seen on this episode of Top Chef (i.e., individual subtleties and extreme attention to detail), Le Bernardin was added to the bucket list without question. It was also great to think that I was about to conquer my second three-starred Michelin restaurant, and my first three-starred Michelin in New York City, with the guy who was there during the first (yay for being with Marcus at The French Laundry!). Hmmm, do I see a pattern forming here? :P (Side note: I would count Alinea as my first three-starred Michelin, but in my eyes, as it was awarded its first stars shortly after I dined there, it wasn't technically "three-starred" at that time of my meal -- didn't want to be presumptuous!). One more thing to note before I get into the nitty gritty details about the restaurant, Chef Ripert, and our dining experience: this might be the pretentious side of me talking here, but I have to say that Michelin-starred restaurants (even more so for the ones on the higher end of the star spectrum) tend to make me more adventurous. What liquid courage does for the shy and the introverted, the Michelin star guide does for my gastronomic risks and wagers. The trust between patron and chef is greater, and therefore, more reliable. A said restaurant wouldn't necessarily be highly rated otherwise. In a way, the Michelin guide can give diners comfort in that the money they plan to drop, for what is to be expected as a wonderful and memorable meal, will yield favorable returns. It makes it easier (for me, at least) to trust the opinions of the captains and wait staff as well as the suggestions offered by the sommeliers. Consequently, I am more inclined to do without substitutions or preconceptions of what I like and dislike (as evidenced with my attitude at Alinea -- many of the courses I had contained ingredients I would typically stay away from, but being able to let go of those insecurities allowed me to truly enjoy what the chef had originally intended for his or her guests -- an awe-inspiring experience). So in the spirit of this way of thinking, I embraced adventure that night at Le Bernardin, waiting for everything Chef Ripert and Aldo Sohm, Le Bernardin's head sommelier, wished to unleash before us. Marcus: I must admit, I maintain a bit of a love-hate relationship with seafood, but the spectrum of intensity, in this regard, is really more of a skew-normal distribution. Nothing gives me more elation than stuffing my face with sushi, sashimi, lobster, calamari, shrimp, and filets of fish (not to be confused with the Filet-O-Fish from McDonald's, which is a giant middle finger to aquatic life everywhere). Nevertheless, for me, seafood tends to bring about the most wickedly fierce stomachaches, which feel like having an oversized, adamantium-reinforced Roto-Rooter digging its way through a quaking tunnel that was once the alimentary canal. However, it is a necessary sacrifice. It is a rite of passage. Seafood is just too delicious to forgo, and thus my masochistic symbiosis remains evermore in effect. Chef Ripert's reputation, though, granted me solace. I knew that Le Bernadin was widely known for having a knack for fish; I was excited to experience my second Michelin three-star restaurant and have an excuse to use a pretentious semicolon. My first three-star restaurant was The French Laundry, where I had a chance to try out seafood courses like the Flétan et St. Jacques en vapeur halibut and the sweet butter-poached Maine lobster "Caesar," and even the dainty salmon cornets. I loved them all, and so I was anxious to see what Chef Ripert's specialization would be able to pull off. Stefie: So some brief background (thank you to Michael Laiskonis, the restaurant's pastry chef, for the enlightening information) on the restaurant and its chefs. The restaurant actually started in Paris back in 1972, by sibling pair Maguy and Chef Gilbert Le Coze. Chef Le Coze was a self-taught chef, dedicated the cuisine of Le Bernardin to fish -- fresh, simple, and prepared with respect, the continued aim of Le Bernardin, even in present day. The restaurant's name was named after "an order of monks who liked to eat and drink and a song about the monks that Gabriel Le Coze, the siblings' father, sang to them as children." Chef Le Coze's new techniques in the kitchen (i.e., "unheard of in the haute cuisine-obsessed salons of Paris's better restaurants in the early seventies") along with Ms. Le Coze's motivating personality in the front of house earned Le Bernardin one Michelin star in 1976. The Parisian Le Bernardin was amazingly opened on a "shoestring budget" with the siblings' parents "helping out in the kitchen as the only employees on opening night" -- the award of one star was an incredible feat. Later that decade, the restaurant moved to a larger location, eventually winning two Michelin stars. At the time, this was the "highest acclaim for a seafood-only restaurant since the powerful Michelin organization reserves the right to bestow three stars to restaurants with menus that also offer meat, game, poultry, and fish to its diners." 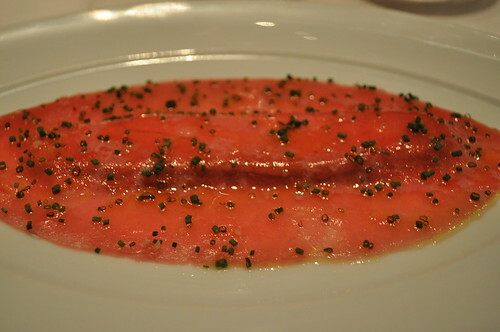 Le Bernardin, however, "insisted on only serving the best fish, carving out a niche in the competitive restaurant world of Paris and establishing an international reputation." A little over a decade after the original Le Bernardin was opened, the Le Coze siblings sought to open a location in New York in 1986. Shortly after, Le Bernardin "became renown for setting standards in the cooking of seafood in America," receiving its first four-star review from The New York Times only three months post-opening. 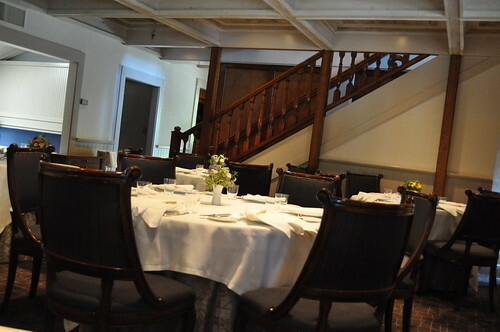 Since then, it is the only New York four-star restaurant that has maintained this accolade for more than twenty years. This is where Chef Ripert comes in. Born in France, Chef Ripert learned to cook at a young age from his grandmother. He went on to attend culinary school in Perpignan, France, after which he moved to Paris in 1982 to work at La Tour d' Argent, the famous restaurant that has been open for more than 400 years. A couple years later, Chef Ripert worked at Jamin under Chef Joël Robuchon and was soon promoted to Assistant Chef de Partie. After a short military stint, Chef Ripert returned to Jamin as Chef Poissonier (French for "fish/seafood chef"). In 1989, the chef moved to the States, hired as a sous chef in the Watergate Hotel's Jean Louis Palladin restaurant, where he stayed for two years before moving to New York in 1991 to work for Chef David Bouley. A year later, he was pursued by Chef Le Coze at Le Bernardin, where he became Executive Chef in 1994 after Chef Le Coze's unexpected death. The following year, at the age of 29, Chef Ripert earned a four-star rating from the Times. Since then Ms. Le Coze has remained co-owner of Le Bernardin with Chef Eric Ripert. After winning several James Beard Awards since 1998 (including Outstanding Service, Outstanding Chef, and Outstanding Pastry Chef), receiving the highest honor of three Michelin stars (being one out of only four restaurants) in North America's first ever published Michelin guide (which was for New York City), and earning the highest rating by Zagat (i.e., 29 out of 30 -- the only restaurant in New York City with such), Le Bernardin continues to shine as a beacon of culinary excellence here. 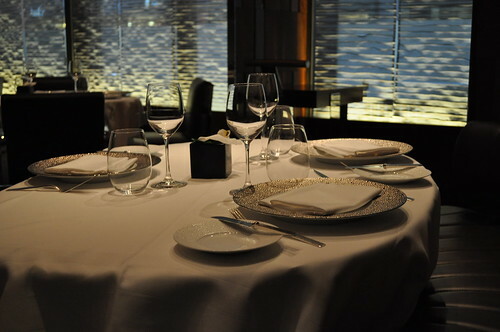 A view of the newly renovated dining room at Le Bernardin. With so much history embedded into the restaurant's culture, Chef Ripert and Ms. Le Coze wished to commit to a renovation that went beyond the usual, simple cosmetic changes. They wanted something less formal, more dramatic, sleeker, and much more contemporary for accommodating the younger clientele that the restaurant has been attracting more and more recently, as Ms. Le Coze mentioned to the Times. The renovation, which lasted over a month, included a total gutting and complete redo of the entire dining room. The designers behind this major project was none other than Bentel & Bentel, the same architects that did the interiors of Gramercy Tavern, the Modern, and Craft. 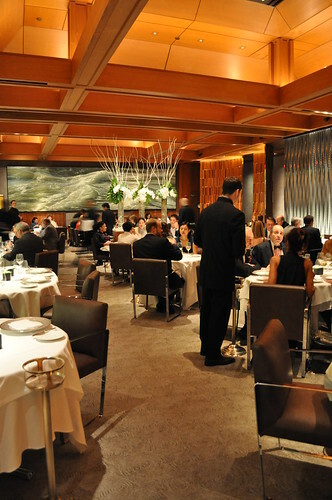 The only remnant of the "old" Le Bernardin that remains is the "elaborate coffered wood ceiling" (see above and second below photograph). There used to be 32 tables, pre-renovation, but now there holds 28, which including some curved banquettes, a first for the restaurant. The dining chairs are upholstered in brown leather with a steel frame (not wood, as previously done), a choice made by Ms. Le Coze "for more modernity." The large painting hanging in the back of the dining room is a 24-foot triptych painting of a stormy sea entitled "Deep Water No. 1" by Ran Ortner of Brooklyn. A very new change to the restaurant is that the entrance area is a simple glass vestibule, directing guests to go one of two ways -- directly into the dining room or into the newly expanded bar/lounge area which accommodates thirty guests, separated from the dining room by teak panels. Along with an abbreviated bar menu (including an assortment of caviar offered by ounce), Le Bernardin will, for the first time ever, have a cocktail menu. Here is the dining décor of Le Bernardin -- love the "bubble" and subtly aquatic theme that carries throughout the restaurant's interiors, as seen on the display plate and the sheer silver fabric that drapes the restaurant's windows. I like that the restaurant now embraces a more modern and contemporary design concept -- it is elegant and sleek without the pretension or stuffiness. The "new" Le Bernardin now welcomes not only the power lunchers and the older crowd, but also the new generation of food yuppies and twenty-something food enthusiasts. Like the way I felt with Veritas, I definitely felt more at ease dining at the "new" Le Bernardin with Marcus than I would have pre-renovation (see "before, during, and after" photographs documented by The Feast). I didn't feel out of place or that the crowd was too "old" for me -- in fact, it was the total opposite. Embracing that old adage, "Less is more," certain worked wonders on the newly transformed dining room. It was so mesmerizing that I spent the first five minutes sitting down admiring the vision Bentel & Bentel foresaw for Le Bernardin before I could even glance through the menu. View of the newly renovated Le Bernardin from our table. Marcus: The interior of the restaurant is very relaxing. The ambient noise, the lighting, and the richness of colors made for an environment that did not feel awkward or stuffy at all, which is actually a big concern of mine when it comes to higher-end restaurants. I wasn't personally familiar with the restaurant pre-renovation, but whatever it is now -- it's definitely doing something right. It was a bit more up my alley compared to the interior environment of The French Laundry, which was still great but perhaps geared towards an older, more traditional crowd. Chef Ripert started us with three hors d'oeuvres. Stefie: The first was golden beet with goat cheese. I found the thinly sliced beet that wrapped the goat cheese to be very juicy, countered by the savory creaminess of the goat cheese. Like my experience with Lynnhaven Farm's goat cheese at this year's Outstanding in the Field farm dinner at Brooklyn Grange, the goat cheese wrapped delicately inside the red and golden beet slices sent a bold message of flavor to and through your taste buds. Don't let the size of these little rolls fool you into thinking they're dainty in taste. Marcus: All I want to say is that those beets are deceptively flavorful and are easy to underestimate -- it's great to have expectations exceeded, even if it's just through small things like these. 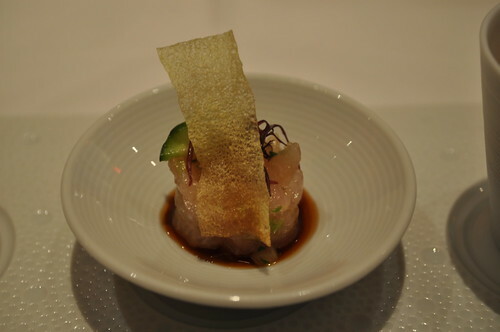 Stefie: The second was hamachi tartare (i.e., raw Japanese yellowtail) with a bonito flake and soy ginger sauce. I found the yellowtail to be really fresh and even better with the soy ginger sauce. The bonito flake added a nice crunch to the chilly soy tartare. Marcus: The hamachi tartare appetizer actually brought back strong memory-sensations of shrimp shumai in terms of taste. While not a bad thing, it was certainly surprising. 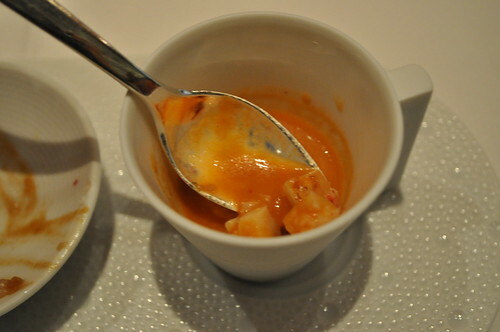 Stefie: The last was lobster bisque -- warm, spiced, and creamy with the buttery lumps of lobster meat waiting for you to scoop up from the bottom of the miniature mug. It was a lovely surprise. When the bread server came 'round, Marcus and I went for the brioche. What a buttery fluff of carbohydrate, which went amazingly with a light smearing of salted butter. Now, I'd like to briefly interrupt the reporting on our meal to address the man behind the magical wine program at Le Bernardin, Aldo Sohm. Originally from Austria, Mr. Sohm's fascination with wine began at the age of 19 during a visit to an Italian vineyard. Since then, he wanted to pursue a career in wine, motivating him to study under some of Austria’s most accomplished sommeliers. Upon graduation in 1989, Mr. Sohm spent the next 15 years working at restaurants in Austria until he moved to New York in 2004. It was then he worked with Chef Kurt Gutenbrunner at Wallsé, Blaue Gans, and Café Sabarsky, leaving three years later to head the wine program at Le Bernardin. The culmination of his experiences in Austria and in New York gave him the know-how and skill to garner the title as "Best Sommelier in the World" in 2008 at the competition hosted by the World Sommelier Association in Rome. What is more is that he was the first representative of the United States to win this title. The competition lasted two days, consisting of pairing food and wine, tasting blindly, taking a written exam, editing a wine list, as well as performing table service in a mock restaurant. Impressive, right?! The first time I had read about Mr. Sohm was in a Wall Street Journal article, "The Odd Couple of Food and Wine," which talked about his culinary relationship with Chef Ripert and Le Bernardin. Besides the obvious relationship between the "Odd Couple of food and wine," the article touched upon wine and the many relationships it has. What intrigued me the most was the wise philosophies shared by Mr. Sohm and wine. His job as head sommelier is that he "can make the food look good" as he has spent hundreds of hours working out the concepts of wine and food that bolster all the great things his reputation says about him. He likes to "compare food-and-wine pairing to relationships" in that the "food and wine should be equal, and they should enhance each other" where "the best possible matches" happen when "the food and the wine transform and elevate each other." Ultimately, isn't that what the perfect wine pairings should do -- wine helping the food bring out its flavors, food enhancing the depth of the wine? You may also wonder what Mr. Sohm thinks about the usual rule of thumb (i.e., reds with meat, whites with seafood/poultry). He acknowledges that it is a good starting point. "Life is simple, but not that simple -- otherwise, I'd be unemployed," he joked in the article. In this regard, he "likes to break, or at least stretch the rules, but only up to a point." He says, "If you do break the rules, you have to make sure it works." So some things he advises that you may need to consider when it comes to pairing wines with food -- the base ingredient, the sauce, and cooking methods. Almost expectantly, Mr. Sohm likes to pair whites with red meat and reds with seafood and poultry. So I guess food and wine, as in love, there must be chemistry! After reading this article earlier this year, I recently came across another article about the new wine glass designed by Mr. Sohm, and later, one very humorous. The latter was entertaining in that former New York Times restaurant critic, Frank Bruni, was enlisted by Food & Wine magazine "to play the role of nightmare diner" to Mr. Sohm's enchanting, almost clairvoyant, wine pairing ability. Needless to say, although Mr. Sohm jumped through some tough hoops and hopped over some high hurdles, he made it to the finish line with the best showmanship any sommelier can do with a testy restaurant guest. So with all of these articles in mind, Marcus and I had to see for ourselves what all the hype was about. Would the wines paired with each dish at Le Bernardin be everything we would have expected and more? Would we cry? Would we be disappointed? Would we be driven to gastronomic orgasms in the middle of dinner? Would we simply just think, What the hell were they thinking (and not in the positive sense)? As a result, the wine pairing with the prix fixe menu was non-negotiable in our eyes -- we were going to do it, at least for the first three courses (i.e., skip for dessert) to maximize our dinner experience at Le Bernardin. The four-course prix fixe menu is divided into four categories. 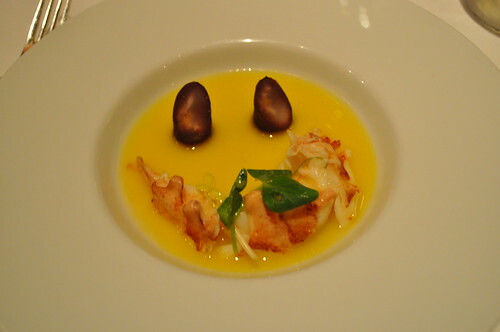 Courses are identified by the main protein (or fish/shellfish/mollusk/sea fare, in the case of Le Bernardin). The first category is the "Almost Raw" first course and is comprised of a selection of dishes with a raw main ingredient. The second category is the "Barely Touched" second course and is comprised of a variety of dishes with a marginally cooked (i.e., done quickly with little needed preparation, or what its category name implies, barely touched) main ingredient. The third category is the "Lightly Cooked" third course and is comprise of a range of dishes with a perfectly cooked (i.e., to the respectively ideal temperature) main ingredient. The last category is just dessert as the fourth course and is self-explanatory -- something that tempts one's sweet tooth. So somewhat similarly to the traditional Italian meal structure (crudo/antipasto, pasta, pesce/carne, dolce), Chef Ripert tailored this to the progression by which his prized protein -- fish collectively -- is prepared (i.e., raw, half-raw/half-cooked, cooked). Very clever and clear! So right before the kitchen had our first course ("Almost Raw") presented before us, our sommelier, David, brought out our first glasses of wine for our respective courses. On the left, he had a 2010 Moscatel Seco produced by Botani from Málaga, Spain, located in the region of Andalucía -- to be paired with my first course, the tuna. 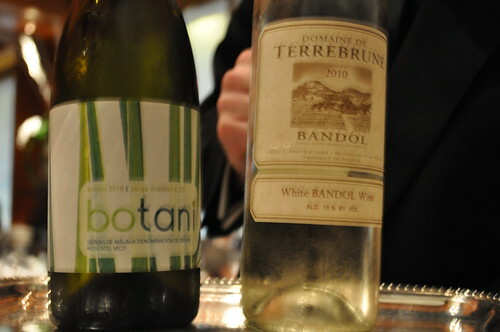 On the right, he had a 2008 Bandol Blanc, a Clairette blend, produced by Domaine de Terrebrune from Provence, France -- to be paired with Marcus's first course, the black bass. As my "Almost Raw" first course, I decided to go with the tuna, which was layers of thinly pounded Yellowfin tuna with foie gras atop a toasted baguette, covered with shaved chives and extra virgin olive oil. Yup, you guessed it, folks -- the foie gras (my perpetual menu weakness) in this dish strongly inclined me to order it. 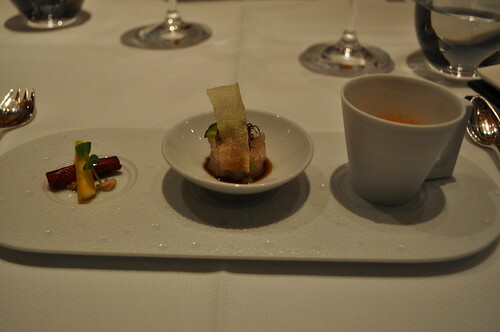 Standalone, the foie gras was very savory, and the tuna was smooth. Together, they created an enjoyable melting sensation in my mouth. Ironically enough, the wine selected to be paired with the tuna (see previous photograph and respective description) was cited in the WSJ article I mentioned earlier as highly suggested to be paired with foie gras, more particularly at Le Bernardin with the very tuna course served that night! Mr. Sohm had said in the article that most people associate muscat (moscatel, in this case) with sweetness, but that this particular wine is technically "dry" (translated from wine lingo to mean having low levels of residual sugar), which works really well with this course in that the little bit of residual sugar "connects" the foie gras with the tuna marinated in lemon juice. This is primarily because a small amount of residual sugar always complements the richness of foie gras. Mr. Sohm sure knows his stuff because the effect the wine had on the tuna-foie-gras combination was seriously mindblowing (please preemptively forgive me for overusing this word as I continue on with the post -- there is not many other ways to describe such a sensation). The course and wine by themselves would have been relishing, but pairing the two together created something dynamically vocal in flavor. They sang out softly, as if it were just piano, almost forte, in volume before the pairing, and suddenly clamoring at fortissimo after they joined forces. The only other time I had such a response to a wine pairing with food was at the James Beard Foundation pop-up, JBF LTD, earlier this year, with Chef Laurent Gras as the guest chef, and Andrea Robinson, the guest sommelier -- while that was just as amazing, I only had that reaction to one course. We had two more wine-paired courses ahead of us, and Mr. Sohm was clearly in this to showcase his seemingly effortless panache at maximizing the fusion of culinary and oenological potential. I knew from this course forward that there was no turning back -- if the meal were an orchestral masterpiece, we were only at the end of the melodic prelude, only to be carried along by a bold and characteristic cadenza and concluded with a beautiful coda. In other words, just imagine the both of us, completely and utterly speechless, only able to utter choruses of "OMG THAT'S REALLY GOOD!" The toasted baguette to accompany the tuna. The serving piece reminds me of the ones I've seen at the dinner I had at Alinea. Very fun and quirky. 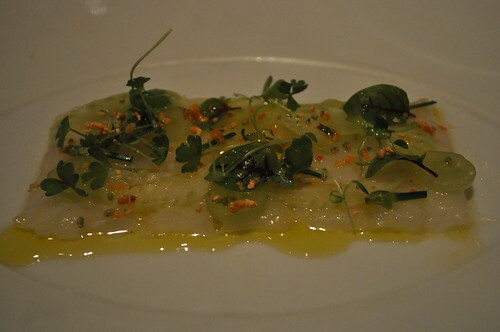 Marcus: For the "Almost Raw" course, I had the black bass, which was flash marinated black bass with sweet and sour grapes, topped with extra virgin olive oil-yuzu vinaigrette. I won't lie -- I didn't find it to have much flavor, especially compared to the tuna that Stefie had ordered. In hindsight, I probably should have opted for something like the salmon, which was the other choice I had been considering at the time. The wine pairing was great, considering the nature of the fish, but I feel like the wine itself was doing most of the heavy lifting. Stefie: Out of all the courses we had that night, this was the blandest (relatively speaking), though I will have to say Mr. Sohm's wine pairing made the dish stand out in taste and flavor a lot more. Shortly after we finished our first course, our sommelier brought out our second glasses of wine. On the left, he had a 2010 Sauvignon Blanc produced by Nautilus from Marlborough, New Zealand -- to be paired with my second course, the octopus. On the right, he had ready a 2008 Chardonnay produced by Patz & Hall from the Sonoma Coast in California -- to be paired with Marcus's second course, the lobster. As my "Barely Touched" second course, I opted for the octopus, which was charred octopus with purple basil, fermented black bean, peach sauce vierge (French for "virgin sauce," which is typically made from olive oil, lemon juice, chopped tomato, and chopped basil, with the lovely addition of finely cubed peaches), and an ink-miso vinaigrette. Just when we thought it would be hard for Chef Ripert to show up his first dish, he effortlessly does so here with this beautiful work of culinary art. This blew me out of the water -- I'm still recovering from the resulting culinary shell shock. 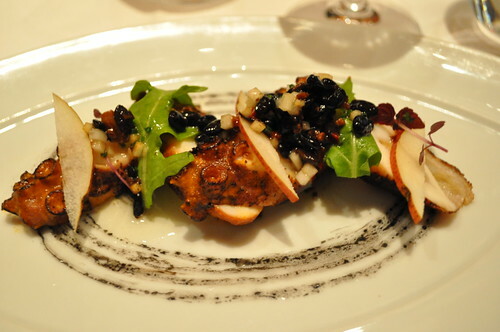 The explosive, piquant flavors matched with the luscious texture of the octopus worked wonders for the gastronomic psyche. The fermented black bean in this dish was very reminiscent of the black bean used in many of the Chinese-style dishes I've had in my lifetime (e.g., snails in black bean sauce, beef short ribs in black bean sauce, razor clams in black bean sauce), and Chef Ripert captured the essence of this commonly used (and very well executed) Chinese ingredient in his octopus course. Oh, and you're wondering about the wine pairing? Yup, Mr. Sohm stepped up his game with the octopus as well -- the pairing with the 2010 Sauvignon Blanc from New Zealand was simply captivating to the palate, almost like you're tasting glorious octopus for the first time ever, and you're able to truly grasp all of its intricate flavors and nuances in the same way a colorblind individual sees colors for the first time. Marcus: I'm always that annoying skeptic who rolls his eyes at people who I feel are just exaggerating their opinions and giving food too much credit simply because of who's preparing it, but I can safely tell you that this is no exaggeration -- this is by far the best octopus dish I've ever had. When I touched that fork to my mouth, it took me less than a second before I audibly uttered, "Oh, wow." I'm not even sure how to describe the flavor. All I can tell you is that if you even remotely enjoy octopus, I'm not giving you a choice. You need to order this dish, or you're doing yourself a disservice. I had the lobster for as my "Barely Touched" second course -- it was a butter poached lobster tail with spiced celeriac and an earl grey-citrus sauce. The lobster did not disappoint -- it was very soft and tender, and skillfully paired with the right wine to offset the citrus kick. Stefie: Mr. Sohm was right about considering not only the base main ingredient/protein, but the sauce in which it is submerged as well. The 2008 Chardonnay from the Sonoma Coast severely enhanced the flavors and spices in the early grey-citrus sauce. The whispers of the sauce soon turned into pleasantly bursting shouts. The lobster, buttery as can be, was cooked to tender perfection. Unlike Marcus, I got a kick out of the presentation of the course -- it looks like a smiley face! The bread server came around before we even realized our bread plates were no longer holding bread. The second time around, I opted for a slice of the raisin bread. 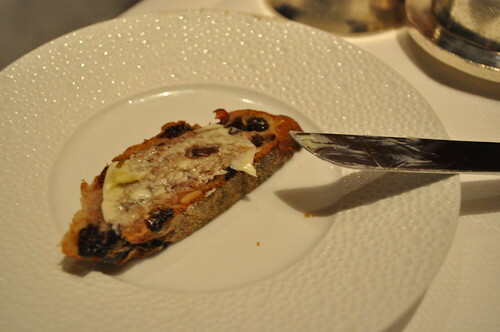 Never have I had bread with this many raisins -- definitely didn't skimp there. Great bread service, but just beware! Don't fill yourself too much on carbohydrates, or you may not make it to the end of the meal! As we were about to embark on the third course, our sommelier returned with our last glass of wine in for our pairing. On the left, he had a 2009 Pinot Noir produced by Copain from the Anderson Valley of California -- to be paired with my third course, the black bass. 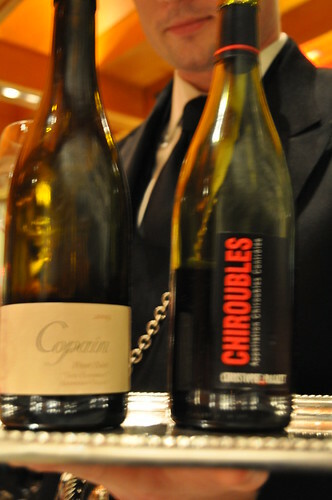 On the right, he had ready a 2008 Beaujolais (made from the Gamay Beaujolais variety of grapes) produced by Christophe Pacalet from the Chiroubles region of France -- to be paired with Marcus's third course, the red snapper. For the third "Lightly Cooked" course, I inadvertently ordered the black bass, when instead, I wanted the codfish. I think I mixed myself up from the euphoria of the meal that I mixed up the black truffle in the codfish with the black bass course. Fortunately, this error was not done in vain (thank goodness!). 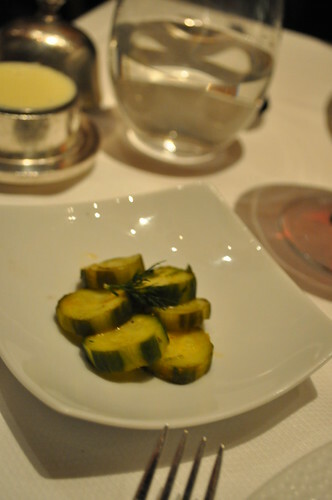 The "Lightly Cooked" black bass consisted of crispy black bass with pickled cucumbers (on the side -- see photograph below) and black garlic-Persian lime sauce. The top part of the filet (where you see the skin) was seared to a crunchy crisp with soft and flaky meat beneath it. 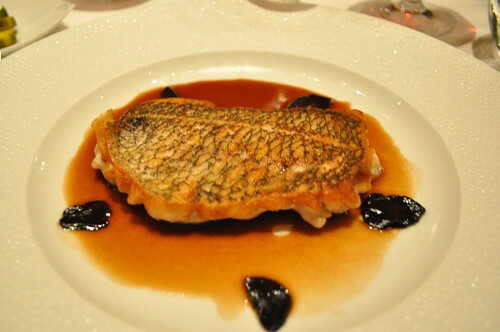 The sauce was light yet absorbed just enough for the fish to take its flavor -- one that was definitely Asian-inspired in tang and sweetness, as black garlic is actually a type of fermented garlic that is frequently used in Asian cuisine. The result of the fermentation (i.e., fermenting whole cloves at high temperatures) turns the clove black, yielding a taste that is sweet and syrupy with subtle hints of balsamic vinegar. Here are the pickled cucumbers on the side, complementing the black bass with its biting sour and briny taste. 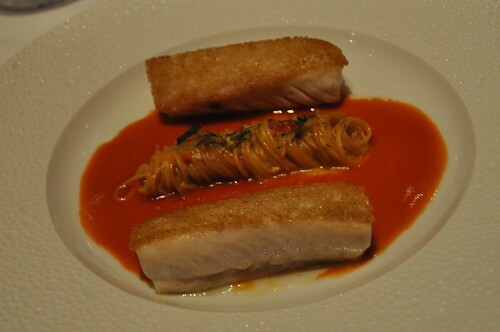 Marcus: I went with the red snapper for my "Lightly Cooked" course, which comprised of bread-crusted red snapper with saffron "fideos" (Spanish for "noodle") over a smoked sweet paprika sauce. Fideos can be described as a Spanish angelhair-like pasta, typically seen in Spanish soups and paella. I loved the flavors of this dish quite a bit. It had the right amount of sweetness and spice, the fish was flavorful, and the noodles were a nice addition (it was almost like a spicy spaghetti). Stefie: My last course of the dinner was the chocolate-olive oil dessert, which was a Dominican chocolate cremeux with toasted bread, brown butter, and Marcona almonds. I liked that this dessert did not only have a sweet side (well, more bittersweet to be exact) from the chocolate but a savory one as well, mostly attributable to the combination of olive oil, Marcona almonds, and brown butter. It wasn't very overwhelming, but still stood out very much in flavor. It was just the right size and portion to end the meal with the right amount of sweetness, because there was already the onset of a food coma coming our way. 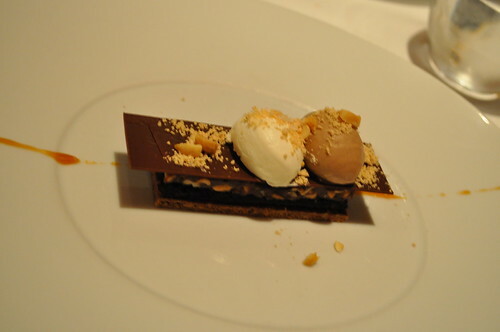 Marcus: For my last course, I decided to order the peanut dessert, which was a salted peanut caramel with Maralumi milk chocolate and a malted milk crunch. 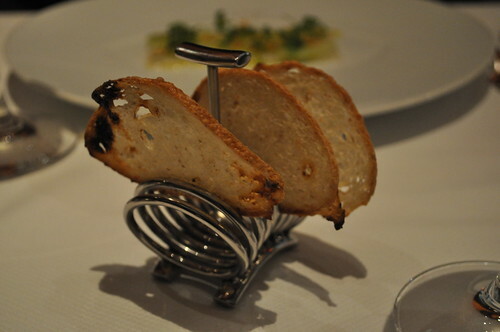 I remember this dish being quiet crispy, like a fancy version of a Kit-Kat. Most certainly I could have eaten another three of these. The two clusters on top provided a creaminess that ensured the entire dish wasn't too overwhelming in texture -- something that may be a typical concern regarding peanut/chocolate-rich desserts. 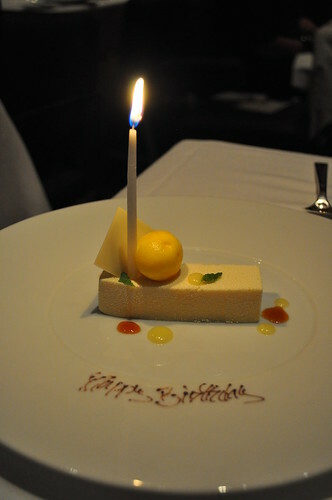 Stefie: In my own true style, I made sure the maître d' knew we were at Le Bernardin to celebrate Marcus's birthday, so the kitchen arranged for this lovely bonus dessert -- passion fruit mousse with lemon sorbet -- which had "Happy Birthday" written in thin chocolate syrup and the added spirit of a birthday candle! The dessert was very light and refreshingly tart -- right up Marcus's penchant for sour and tart foods and flavors. Marcus: The dessert was a thoughtful and nice touch to the end of the meal. I was pleasantly drunk by the time this rolled around, but I remember only good things. It wasn't too sour at all (a good thing, since overly sour lemon flavor is a very common gripe I experience with most lemon desserts). Very light and fluffy -- just what I needed after all that fish and wine. Stefie: These were the mignardises (i.e., the tiny, bite-sized desserts served at the end of a meal) served right after we demolished our desserts. The first (far left) was a salted caramel chocolate truffle, followed by a rose macaron, followed by a vanilla bean custard petit-four whose name escapes me now, and a miniature éclair. 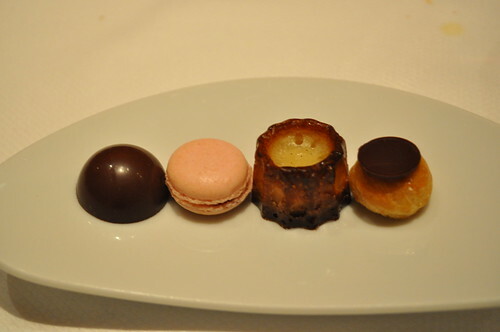 Each mignardise captured the essence of its originally-sized counterpart in a bite-sized morsel. On top of the birthday dessert sent from the kitchen, this made for another satisfying ending to the preceding amazing meal. 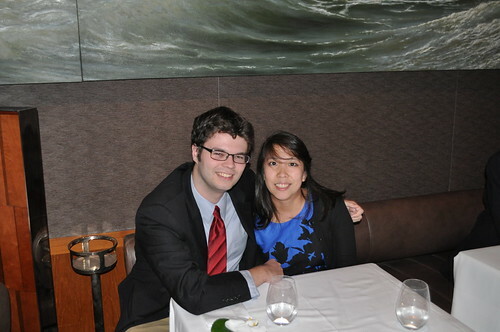 Marcus and me at Le Bernardin. 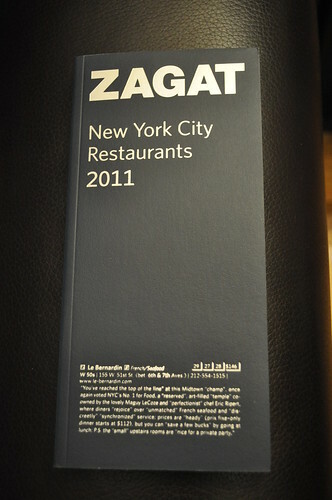 Just as we were saying our farewell to the restaurant after this amazing meal, the maître d' handed us a parting gift -- a complimentary copy of the 2011 Zagat guide for New York City restaurants. What a nice gesture!, I thought, especially when I saw the featured blurb of Zagat's review of Le Bernardin emblazoned on the bottom part of the cover. Definitely makes for great promotional value for both the restaurant and Zagat, considering Le Bernardin has the lucky honor of holding the highest rating (i.e., 29 out of 30) for food, where its scale defines a score of 26 through 30 as "extraordinary to perfection." While I haven't really been a big fan of the popular guide, I do find its blurbs, tips, recommendations, etc. to be useful and informative. Stefie: My favorite restaurant adventures and experiences are the ones that are effortless to write, firstly because that usually means that I have a lot to say and secondly because I probably am super psyched to write, share, and tell all about the intricacies of the said meal. 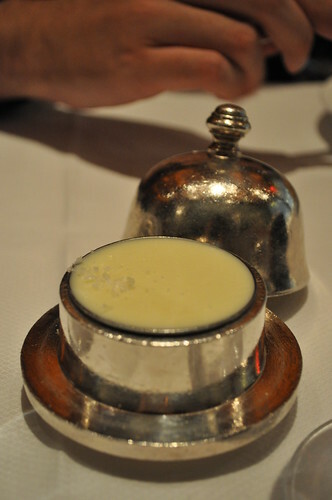 With that being said, Le Bernardin was no exception to this -- what a freaking extraordinary dinner! I had my reservations about going in the first place, because I had heard mixed things from my inner circle of reliable foodie friends. Some raved about the amazing culinary talent possessed by Chef Eric Ripert (thanks to Linda and Alice for the encouragement to take the plunge to finally go -- without the negative connotation, of course), while others said the courses they had ordered during their visit was mediocre and hit-or-miss, resulting in a pretty unanimous conclusion that the restaurant be indeed be overrated. Given the mixed reviews, I wanted to give Chef Ripert and Le Bernardin a fair-and-square chance before I should pick a side to stand behind. Though I had my initial hesitation and concerned (would it be everything its proponents said it would be? ), pre-dinner jitters, I'm glad the kitchen put me back in my place by way of a gastronomic stun gun that sent me to a realm where the complex and delicious flavors of seafood reign supreme with the aid of some boldly stated wine pairings by Aldo Sohm. I was extremely impressed (and humbled by) with the first three courses of our Friday night dinner -- out of these six courses between the two of us, we were so incredibly pleased with five out of the six (the "Almost Raw" black bass being the odd one out), which I think to be an amazing feat to accomplish (and with crazy finesse, too!) at a restaurant that offers with a four-course prix fixe dinner. I think what may have happened with my disappointed friends may have been a lack of meaningful conversation between you/your dining party and your captain. Ever since Eleven Madison Park underscored this important conversation between the service and the guests when they revamped its entire menu, I have aimed to embrace this philosophy in each and every personal dining experience, more specifically the ones that involve fine dining. It is important to not only understand the menu items and their ingredients but to also fully grasp the preparation behind these items and how they may affect the combination of ingredients and the ultimate resulting taste. Thus why a conversation with your captain about what you're considering, what he or she recommends/finds as his or her favorite courses is key. They are not only intimately familiar with the menu (with all of its nuances -- anywhere from the inclusive ingredients, the preparation, and such), they are constantly interacting with patrons daily, which only add valuable experience their already comprehensive knowledge of Le Bernardin and its trove of gastronomic wonders. They have become wizards of the recommendation and knowing what personal tastes may influence a stronger liking over one course to another. I definitely felt our conversations with our captain helped us understand Chef Ripert's interpretation of a certain fish; why an alternative course (i.e., one we wouldn't consider ordering) may be the better choice; and which of our initial impressions from our menu choices (it was usually between two or three items from each category) would be the best, especially considering the other items we had already selected or were planning to select. What I also enjoyed about the service team over at Le Bernardin was that nothing was ever pushed on you -- your decision was always respected, and your comfort zone was thoroughly embraced. I didn't feel rushed, uneasy, or pressured to order something I wasn't already considering. This may very well be one of those posts/stories/narratives that Slate writer, Noreen Malone, would dub as an "I Ate at ___" piece (coined in her article about the flood of food writers aggrandizing about their exclusive experiences at Chef Ferran Adrià's now-shuttered elBulli). And while she may have a point, I don't really care in this instance. 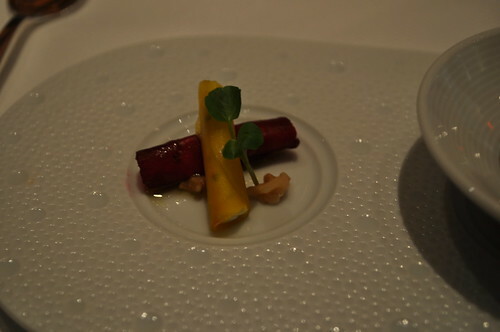 Our celebratory dinner at Le Bernardin was sensational, phenomenal, and simply put, mind-blowing. So I apologize if there were too many metaphors and hyperboles peppered throughout this post -- I simply couldn't help it! It was too awesome of a meal to not share with the world -- I almost feel the need to shout it from a rooftop somewhere! The wine pairing was just out of this world, something that should be experienced at least once in one's lifetime. So calling all winos, bon vivants, and anyone who is willing to lose himself/herself in a wondrous meal at the lovely Le Bernardin -- prepare to have your socks knocked off. Maybe it was the new contemporary, modern renovations done by Bentel & Bentel that did most of the persuasion that this establishment was by no means overrated. It was the understated beauty of a space matched with Chef Ripert's savoir-faire in the kitchen and Mr. Sohm's finesse with the complexities of wines and spirits that all had me at hello. 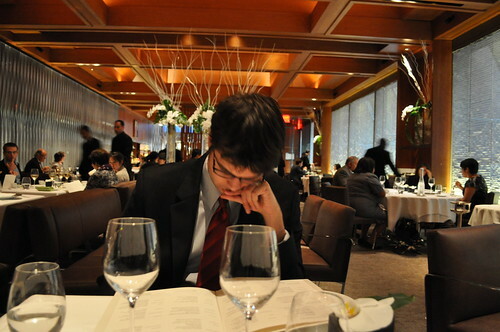 With all of that on the table, would it be blasphemous to say that our dinner at Le Bernardin was "better" (gasp!) 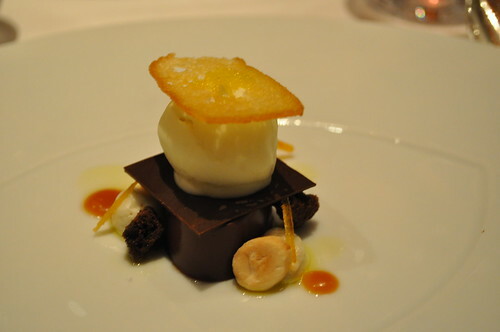 than the stops pulled by Chef Thomas Keller's kitchen at The French Laundry when we were there this past spring? I almost feel guilty (in fact, I actually do!) when these thoughts first came to mind at the end of the meal, especially when Marcus and I were attempting to draw our preliminary conclusions. Maybe "better" is the inappropriate word choice here -- perhaps "preferable" may be more fitting. I think the style of dining at Le Bernardin is a little bit more fitting to my personality and aligns more with what I look for in a relaxed dining experience. Another winning point is that the service team was very welcoming, accommodating, and very easy to talk to, and the dishes we had just spoke for themselves in delivery and execution (as noted in our detailed review of each course). Now, I don't want to do Chef Keller any injustices here -- he's still the chef I hold dearly close to my heart. But who says Chef Ripert can't be standing there right next to him? Upon meeting Chef Ripert at a book signing last year, he was reserved and friendly. I didn't get a feeling of pompous jerk from him at all -- instead, a warm, kind man sat behind the table, graciously thanking me for picking up his book and for coming out to his book signing. Along with the ability to impress me on a food level, I also admire a humble chef, who is grounded, well-spoken, and knowledgeable -- none of it goes to his/her head. Certainly, Chef Keller, along with Chef Ripert, is committed to this humility in the kitchen and in the world of culinary celebrity. All in all, it is refreshing to know that these kinds of chefs are still out there (Chef Daniel Humm included), and I'm happy to add Chef Ripert into my personal mix of favorite culinary rock stars. 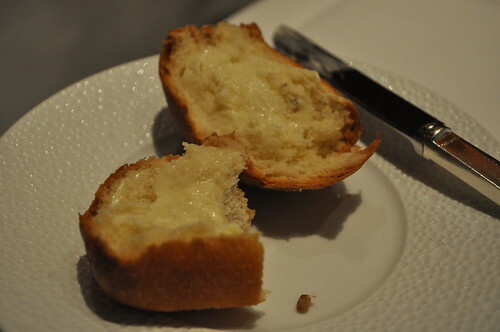 I don't need to reiterate how dumbfounding our experience at Le Bernardin was. Just go there (preferably for lunch if you can, as its lunch prix fixe offers most of the items on the dinner one, but as an abridged three-course meal at a bargain price of $70) and mentally prepare yourself to be whisked away to a happy place you may never have been before. It will undoubtedly be the best money you will have spent on yourself all year. One more thing -- Marcus, I would like to wish you a very happy birthday again! I'm so lucky to have a wonderful guy like you in my life with whom to share these unforgettable meals. Hope you enjoyed your birthday dinner as much as I did -- definitely one for the infamous "Stefie and Marcus" archives! Happy Birthday, Marcus -- here's to many more! Love you! Marcus: First I'd like to thank Stefie for the amazing birthday dinner. It was one of the best meals I've ever had, and it honestly pains me to admit that I preferred it to my experience at The French Laundry. It's certainly no fault of Chef Thomas Keller, but rather a difference in personal fit and service. I enjoyed the relaxed yet visually upbeat atmosphere and never felt like I was out of place; the service was so prompt and courteous that it felt like my table was the only one being served that night. Your water glass will typically be full at all times, and there will always be food and wine in front of you to enjoy. Any time lapse in which this is not true will be extremely short-lived. Overall, I was impressed. I had heard horror stories from other people who claimed their fish had been undercooked/overcooked, but I never experienced anything of the sort. Everything tasted great, with the one exception being the "Almost Raw" black bass course. It's hard for me to find much to criticize (I'd have to really dig, but there's really no point in being pedantic when the meal was so memorable). I had a fantastic time -- thank you again, Stefie. I promise your birthday dinner will be just as good! Price point: $115 per person for the four-course prix fixe menu, $14-23 for each glass of wine in our three-course wine pairing flight (approximately $53 per person as a result of our menu choices).